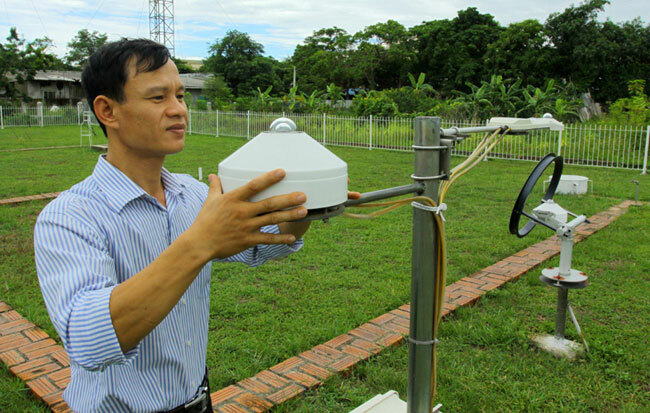 HA NOI (VNS) — The Government has approved a project to modernise the natural disaster warning and forecast system at the northeastern region's hydro-meteorological centre, with the help of non-refundable aid from South Korea. The project aims to improve hydro-meteorological monitoring and forecasting by upgrading the centre's infrastructure and providing intensive training for personnel. The project is expected to take 36 months, with investment of US$3.97 million from South Korea and more than VND9.66 billion ($46,000) from the Vietnamese Government. Deputy Prime Minister Hoang Trung Hai has asked relevant authorities to set up plans responding to super storms and hurricanes. Hai asked the central steering committee on natural disaster prevention to develop plans to cope with super storms and hurricanes and report to the Government in June. He also instructed the Ministry of Agriculture and Rural Development to build a map of projected flooding caused by rising sea levels and super storms. The ministries of Planning and Investment and Finance were asked to balance the budget and report to the Government on the allocation of funding for repairing sea dykes, repairing reservoirs, constructing boat shelters, a tsunami warning system and relocation of affected households.